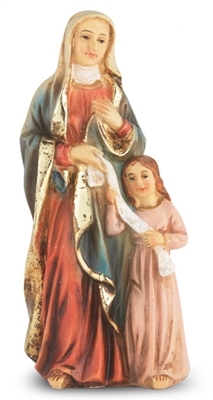 Saint Anne was the spouse of St. Joachim, and was chosen by God to be the Mother of Mary on earth. They were both of the royal house of David, and their lives were wholly occupied in prayer and good works. One thing only was missing from their marriage-they were chidless. After a long wait, when Anne was an older woman, Mary was born. With the birth of Mary the aged Anne began a new life, and felt herself sanctified by the presence of her immaculate child. This finely detailed statue has been expertly sculpted by Barbara Tortolani, a New England artisan noted for exquisite life-like detail that she portrays in all her creations. The statue is crafted in cold cast resin and hand painted for fine detail resulting in a venerable gift to be always cherished. Saint Anne is the patron saint of grandmothers, mothers, housewives, housekeepers, and women in labor.